Pyongyang, September 11 (KCNA) -- Kim Jong Un, chairman of the Workers' Party of Korea, chairman of the State Affairs Commission of the DPRK and supreme commander of the Korean People's Army, arranged an art performance and a banquet on Monday for the party and government delegation of the People's Republic of China led by Li Zhanshu, member of the Standing Committee of the Political Bureau of the Central Committee of the Communist Party of China and chairman of the Standing Committee of the National People's Congress of the People's Republic of China, who is a special envoy of Xi Jinping, general secretary of the C.C., CPC and president of the PRC. The art performance was given at the Mansudae Art Theatre for the Chinese guests of honour on a visit to the DPRK. Kim Jong Un and his wife Ri Sol Ju enjoyed the performance together with Li Zhanshu and his delegation members. Among the audience were Choe Ryong Hae, Pak Kwang Ho, Ri Su Yong, Pak Thae Song, Kim Yo Jong and other officials of the C.C., WPK and the State Affairs Commission. Invited to the performance were Li Jinjun, Chinese ambassador to the DPRK, and his embassy staff. Kim Jong Un and Ri Sol Ju, greeted the members of the party and government delegation of the PRC at the lobby of the art theatre. After exchanging warm greetings and posing for a photo with the Chinese guests, he had an amiable talk with them. When the Supreme Leader appeared at the auditorium, followed by the Chinese guests including Li Zhanshu, the audience broke into enthusiastic cheers, extending the greatest glory and the warmest greetings of best wishes for him who has performed imperishable exploits in strengthening the DPRK-China friendship. Put on the stage were such colorful numbers as male solo "Fly High, Our Party Flag", orchestral music for kayagum "Arirang", female solo "We Sing of the Party", female chorus and male chorus "Along the Road of Socialism", as well as Chinese songs including female solo and male chorus "Song of Changjiang", female chorus " The Fluttering Red Flag", female quartet "May You Be in Good Health", female chorus "I Love My Chinese Nation" and female solo and pangchang "New World". The performance culminated with the finale "Korea-China Friendship Will Be Ever-lasting". 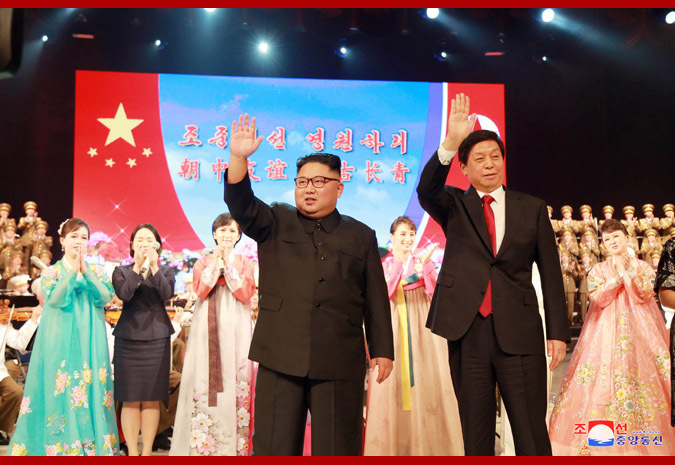 The performers sang high praises of the dignity and prestige of the DPRK dynamically advancing along the road to the victory of socialism under the wise leadership of the WPK. And they demonstrated the invincibility and durability of the DPRK-China friendship booming decade after decade, century after century, under the special care of the top leaders of the two parties and the two countries. A floral basket in the name of the Chinese delegation was presented to the performers as a token of congratulations for their successful performance. Kim Jong Un, together with Li Zhanshu, mounted the stage to congratulate the artistes. That evening he hosted a banquet in honour of Li Zhanshu and his delegation. Choe Ryong Hae, upon authorization of the C.C., WPK and the State Affairs Commission, made a speech to welcome the Chinese guests of honour. The Supreme Leader had an amiable talk with Li Zhanshu and his delegation members, while the banquet was proceeding in a friendly and amicable atmosphere.